What do you call a man who is married to a rabbi? Well, this wasn't really a question until about 30 years ago when women were first allowed to be ordained as rabbis. If you ask my friend Jon Drill, who is married to my classmate Rabbi Paula Mack Drill, he prefers the title "The Rebbetzman" and proudly explains that to anyone who attempts a rebbetzin joke. Now he can be the Rebbetzman in a t-shirt that proclaims his pride for being married to a female member of the clergy. Rachel Silverman, a rabbinical student at the Conservative movement's Jewish Theological Seminary, saw someone wearing a T-shirt that stated, "Real men marry doctors." "Wow," she remembers thinking. "I need to make that for rabbis." 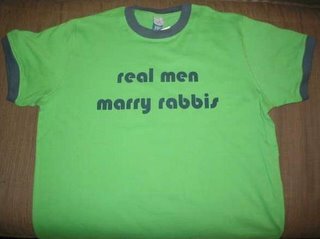 She found an online T-shirt imprinting company, and picked out a clover green shirt, with blue lettering "real men marry rabbis" and trim around the sleeves and neck. Within days, she was selling her creation, all through word of mouth. 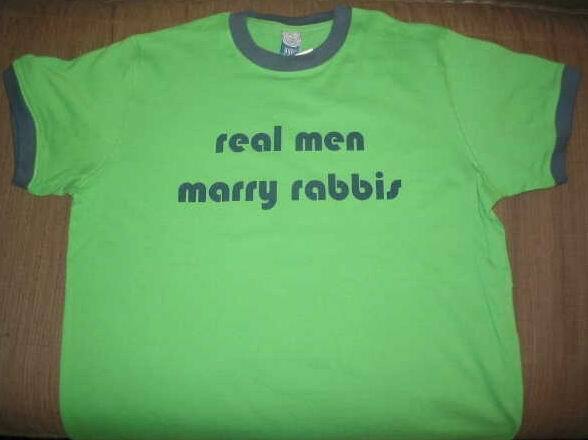 To order the "real men marry rabbis" t-shirt just send an e-mail to the creator Rachel Silverman at rachelariel@mac.com or go to this website. By the way, when you order one of these t-shirts Jewish Women International benefits. Hi - I refound this post, and just wanted to make sure to correct the email address linked to my name. I can be reached at racheariel@gmail.com - if you want to buy the shirt.